Some state legislatures make selecting a form will simple by providing one in the probate statutes. Maine's statutory will form is typical; its introduction reads: "Any person may execute a will on the following form and the will shall be presumed to be reasonable." Selecting this will-drafting option simply entails filling in the blanks. Early blanks identify the person drafting the will; later blanks provide devises of real property and personal property, and identify guardians, conservators, or those who manage children's assets, and personal representatives, also called executors. The final section provides places for your signature and those of witnesses. Only a handful of states offer statutory wills. If yours doesn't, ask a law librarian or your state's Bar Association for a form will approved by the state Bar Association. A state-specific form eliminates research since state requirements -- age of testator, for example -- appear in the will terms. All states regulate execution -- how to sign a will -- and most invalidate wills improperly executed, yet witness requirements vary among the states. With a trustworthy form will, a testator simply fills in the blanks -- including witness signatures -- according to the instructions provided. Create your own will by mimicking the provisions of a form will, from testator identification through proper execution. Critical research includes testator age requirements -- 18 years old in most states -- and number of required witnesses -- at least two in almost all states. Begin by typing your name, date of birth and address. Add your disposition of real property and personal property, either making percentage devises -- for example, "90 percent of my estate to my spouse" -- or specific devises -- for example, "my house located at 123 Grand Street in Malibu, California to my spouse." Appoint any guardians and an executor, then put sufficient witness signature lines to comply with your state's laws. Select adult witnesses not otherwise named in the will. Advise the witnesses that the document is your will, then sign in their presence before asking them to sign. 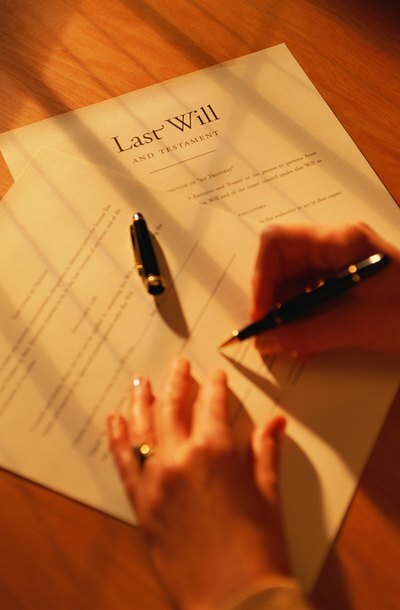 Many states allow handwritten, unwitnessed wills in emergency situations -- for example, if a testator faces imminent death; a few accept holographic, or entirely handwritten, wills in all circumstances. California's probate statutes, for example, permit any testator to write out her own will. It is valid without witnesses if written completely in the testator's hand, including date and signature. Research your state's laws regarding holographic wills before selecting this method of drafting. Include testator identification, devises and appointments, as in prepared wills. You need not use witnesses nor a notary public.